This symposium, which in only one day tried to cover the appearance of the black subject in art from ancient times up to modernism, was a gathering together of interesting recent research, given by compelling speakers. It is unusual for me to attend a symposium or conference and not feel bored at least part of the time. I am happy to report that at no point did I find myself thinking “why on earth did they put that on for/” or “who is this person and how can they have the nerve to stand there talking like this?” No, this was a timely, well-organized and utterly fascinating day. Part of the appeal was just the absolute necessity of this discourse. I have written on a number of occasions* about the invisibility of the non-white artist, and the working-class artist, but I haven’t really talked much about the invisibility of the nonwhite subject. Actually, it was exactly this issue that brought the whole problem to my attention: the invisibility of nonwhite subjects in paintings. I wondered why, despite the plethora of images of black subject in advertising, when it comes to fine art, contemporary artists don’t go there. Then I realized that that’s not it: the problem rather is that the contemporary artists who do make those pictures are much less visible than white artists. A large part of the symposium was dedicated to “finding the black face” in art history. Although this might sound a bit odd, I believe that it’s a necessary act, and one that really needs to be done more. And when I say done more, I mean addressed within the education / Museum situation. For example, in the late medieval and early Renasissance, it was common for at least one of the Magi to be depicted as a black person. Why not actually draw attention to this and make it talking point within a museum display? There are many depictions of white people with black servants, but this offers a possibility to broaden out the art historical discussion. This point was made by the curator Jan Marsh, who helpfully provided a useful list of images of paintings of Black subjects in British art institutions. I think at the root of it all is probably the fact that we still labor under a misconception which probably comes out of the 18th century. The 18th century saw the rise of industrial capitalism, of which slavery was the first development, fueling the money that was then available to build factories and develop technology. This obviously meant that the black population of Britain, particularly port cities would’ve increased and the availability of black servants would’ve increased also. Hence the depictions in art. The 18th century also gives us something else: a kind of whitewashing of the history of the ancient world. Thanks to the Hellenistic endeavors of Johann Winckelmann, we have a picture of the ancient world which is largely white, as white as the marble statues and temples of the ancient Greeks and Romans. Except that this is not true at all. This whitewashing of the ancient world, extends quite laughably to our visual image of it, the white marble image of Aryan perfection. Except that we actually know now that the ancients painted their statuary and all of their temples. I refer you to the brilliant book Chromophobia by David Batchelor for more on this classical legacy. The Greeks did have a concept of barbarians and Greeks, but this is not based on race. The Romans, on the other hand, didn’t have any racial ideas whatsoever. Their distinction was whether you were Roman citizen or not, and whether you were free or not. Once you had freedom, it didn’t matter what color you were. Roman hierarchy was not racially based. Going along with that was the fact that the and Roman world, the Mediterranean, was conceived as being the entire Mediterranean, not just the North Mediterranean. The ancient world included Africa. People from Africa, certainly North Africa and also Ethiopia, existed all over the ancient world, traveling, trading, working, fighting. Graffiti from Egyptian soldiers sent to man Hadrian’s Wall attests to their disgust at British weather. Some things will never change. And there are some ancient works of art which never get mentioned at all, such as the marvelous, splendidly realistic Fayuum portraits made in Roman Egypt. These were funeral portraits, made during a person’s life, to be used in attached to the sarcophagus after death. Recent scientific analysis has proven that the portraits, which show dark eyed, dark skinned people, appear to be of ethnic Egyptians, not white transplanted ‘Romans’. Once again, the concept of ‘Roman’ is not racial. And those portraits would have been made by Egyptians. However, once we have a concept of the ‘wonderfully white’ ancient world, and the Europe sanitized of all nonwhite inhabitants, we then get a completely different perspective on the reality of black presence in Europe. Yet, any kind of historical sense makes it clear that could never have possibly been true. Even a casual glimpse at trading patterns across Europe would make it clear that there was a constant two-way traffic between North Africa the Middle East and much further beyond. It is probably true that, then as now, urban areas were more diverse than rural areas, although even that may not be the case. William Mulready’s 1835 painting The Toy Seller shows a black peddler selling toys to a white mother. Although we can’t take the painting as any kind of documentary piece, it does seem to indicate that the rural world was not quite as ‘bleached’ as we pretend. Of course, the first thing we have to admit is that the actuality of slavery, forced us into a black and white thought dichotomy. The dichotomy of black / white, dark / light existed probably forever, but was not necessarily attributed to human beings. Because in the Mediterranean region and Persia (where Manichean beliefs about dark and light developed out of Zoroastranaism) people usually aren’t specifically black or specifically white, but have different degrees of pigmentation. So, having spotted the black faces in the history of European art, what next? Actually, the answer was provided right at the very beginning of the symposium. The artist Kimathi Donkor discussed his own work as a painter, which interrogates mis/representations of black subjects in Western art history. His current research is on the the representation of Andromeda (according to Ovid’s story, an Ethiopian princess) who is usually portrayed as white. What’s really important about Donkor’s work is that he’s one of the few recognized figurative painters active in Britain today who portrays black subjects. Yes, that’s exactly what I said: one of the few. I became familiar with his work Toussaint L’Ouverture at Bedourete, a powerful and strongly cinematic depiction of the Haitian revolutionary hero. I was really impressed with this painting, a remarkable piece in the grand tradition of history painting and, I think, a very important work. One of the problems with art history, of course, is that with very few exceptions such as H.O. Tanner, the one doing the representing is white. It’s only in the 20th century that we start to see a trickle of representing being done by black artists. But even those are largely invisible in terms of European modernism. One of the most stimulating presentations, which is saying something in a day full of stimulating presentations, was by Prof. Partha Mitter. Discussing the work of Jamani Roy. I didn’t know anything about Roy before but what Mitter talked about was the idea of alternative modernisms. I’ve always been interested in this, the idea that modernism has been interpreted purely from Eurocentric perspective, which if you think about it is absolutely ridiculous. Especially when you think about how the architects of modernism were themselves completely influenced by Eastern philosophies; one of the things most noticeable in the recent Matisse exhibition was how influenced Matisse himself was by Moroccan visual culture. This limited approach to something as universal as art-making leaves out Egyptian modernism for example, as well as the whole of Latin America, Africa and Japan. The art market may reward the Eurocentric interpretation of modernism, but why should we? The symposium didn’t really address the subject which I left wondering about, which is how to get all of this fantastic research into the broader public discourse. Where are the art history television programs that present this art history? Where are the non-white artists in the major prizes, and television portraits such as “what artists do all day”? 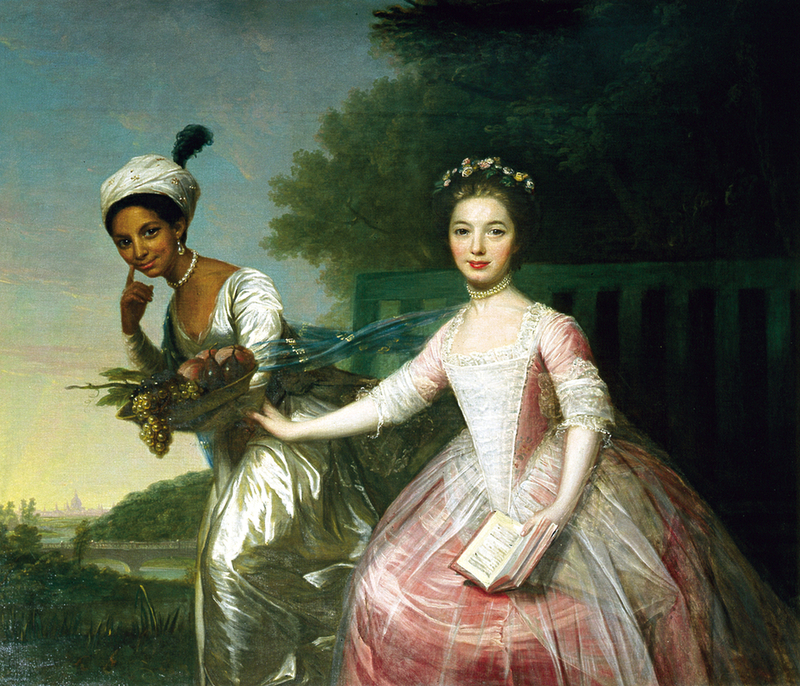 It is necessary, but not enough simply to spot the presence of black people in art history. We need to see them in contemporary art as well. We need to encourage and support artists who want to depict their reality, black subjects. Because these black subjects are part of our reality. The faces of our history, our neighbors, our friends, our families. 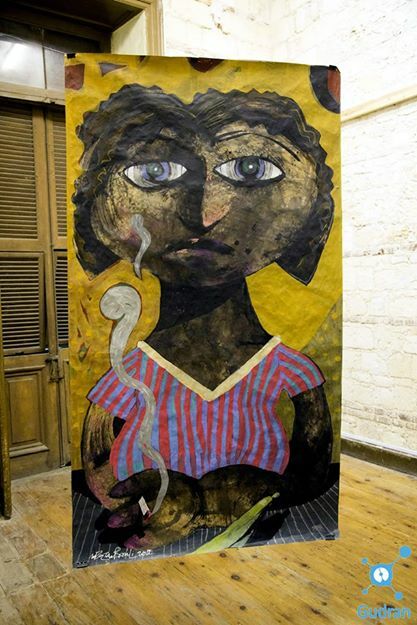 Donkor’s work is significant and necessary, as is the work of artists such as my colleague, the London-based Egyptian painter Nazir Tanbouli. The commercial demands of the art market does not seem to be interested, which is their prerogative. After all, they’re mainly interested in buying and selling, whether it’s arms or paintings. But once again, I have to say that we need to examine how and why the criteria of the art market is so accepted completely uncritically, not only by our media but sadly, also by the curators and critics, and those who are supposed to be nurturing our art tradition and building our artistic legacy. Kimathi Donkor, Michael Ohajuru, Temi Odumosu, S.I. Martin, Michael Fisher, Caroline Bressey, Florian Stadtler, Jan Marsh, Gemma Romain, Roshan McClenahan and Partha Mitter, hosted by David Dibosa and Sonia Dyer.